The union representing Connecticut’s Judicial Branch marshals has filed a complaint with the Department of Labor charging that the hiring of state police to patrol outside courthouses violates its contract. The department's Board of Labor Relations, which received the complaint Monday from Local 731 of the International Brotherhood of Police Officers, has scheduled a July 7 conference on the complaint. The union, facing major layoffs as the Judicial Branch grapples with a deep budget cut in the fiscal year that begins July 1, argued that the temporary use of troopers to enhance security is permitted under its contract with the state — but not if it supplants security services provided by marshals. Gov. Dannel P. Malloy and the legislature reduced branch funding by $77 million below the preliminary 2016-17 budget established last summer. Trying to close a nearly $1 billion deficit in the overall state budget without raising taxes, the governor and legislature imposed cuts on most agencies, though court officials say the Judicial Branch is absorbing a disproportionate amount of fiscal pain. Part of the branch’s response to that cut was 239 layoffs — including 101 marshals — and the elimination of another 61 temporary positions. Both branch officials and union leaders have said they believe the current contingent of 667 marshals should be larger. It’s well below the 840-marshal level the court system enjoyed in the early 2000s. Further complicating matters, the Judicial Branch also is counting on eliminating 200 to 300 positions across all branch jobs in 2016-17 through retirements, resignations and other attrition factors to keep its budget in balance. Court officials have said about 60 marshals retire annually, on average, and it's unclear whether those will be replaced. But branch leaders also have said the decision to hire state troopers — at $60 to $75 per hour — to patrol outside of courthouses in four cities both last week and this one, is not related to the marshal layoffs, which began late last week. Joe Gaetano, president of the marshals’ union, disputes this assertion. 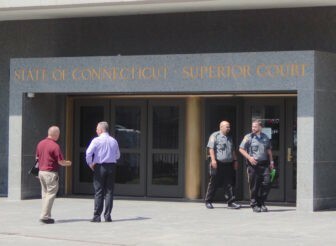 Troopers originally were hired to patrol outside of a Bridgeport courthouse on June 17, one day after a gang-related fight broke out outside of the building. The branch then retained troopers to secure the perimeters of courthouses in Bridgeport, Hartford, New Haven and Waterbury starting Monday, June 20. Court officials renewed those assignments this week, and have said they will decide on a week-by-week basis whether the additional security will be retained. Judicial Branch spokeswoman Rhonda Stearley-Hebert said Tuesday that "we received the grievance, and we will respond to it in the appropriate forum."